Life is funny, isn't it? Unexpected challenges appear overnight, followed by dark days and then the light shines through when you least expect it. It's a true journey and to be told otherwise, is well, a bunch of baloney I have learned. Nothing is perfect, no ONE is perfect, least of all myself, but as we grow and stretch and push through and keep moving forward, it's the little moments of awareness and special gifts along the way that make each and every day truly "a gift." A good friend of mine just posted this on Facebook today, "when life gives you lemons, make lemon cupcakes. "....love it- and of course she really meant to say, "gluten-free lemon cupcakes!" You see, I've been more introspective and reflective in the past year and a half than ever before in my life. I love being in my (late - gulp) 30's and being able to consciously see positive changes that I'm making in my life and have made, thus far. I feel more "awake" than every before and I owe much of this awareness to having Celiac Disease. I think back to just ten short years ago when I was diagnosed and 1) wonder where on earth the time has flown to, and 2) feel as though I've lived ten different lives along this journey though this past decade. All moments, experiences and pieces of my puzzle that have put me exactly where I am in this moment. Time is a funny thing - it's also a trap, to some degree. I built this zen/meditation garden (above) in my backyard last week. I've felt really compelled to have a special place to sit and meditate, while being in the beauty of the outdoors and my backyard...the location in my home. I built this just for me. To give myself a place to go whenever the moment calls, through good days and tough days; a place to reflect and be still and say, "thank you." Living with disease is an interesting part of one's life. I decided long ago it would not define my existence, yet Celiac Disease has opened up an entirely new life and world to me, lending perspective that I would never have, if not for an intolerance to gluten. I also know that the emotions and challenges in my younger life were the catalyst for this disease finally surfacing, so with that is yet another journey in itself to wade though - but I put my waders on, so I'm in the water and feeling safe and dry. I have a dear friend who has been ill for almost two years now - struggling with so many autoimmune issues that hit her very suddenly. She barely knows what to eat at this point and her poor stomach is completely on defense, practically rejecting every food-source she tries to get down. Having Celiac Disease has allowed me the gift of huge compassion and empathy for her, and many others who are struggling. It's the least I can do. Along my new zen-like path I see the magic that shows up sometimes when the right kind of positive intentions and energy are set-forth. This past week I must have had, "I'm gluten-free" written on my forehead because the Universe kept bombarding me with just that topic and people looking for assistance, advise or answers. Pretty cool. One such call came from a local health reporter with the Reno Gazette Journal. 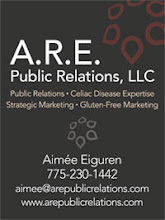 She had heard from another reporter I work with that I am a Celiac advocate and write a blog about it. Not only did I get to assist with some of the facts in the article that ran this week titled, "Goodbye Gluten," but I got a little press about my Celiac work and she ran one of my recipes! It was exciting and I was honored to contribute. I always am! In other GF news, I stumbled upon this story that I found interesting titled, Eating and Thriving on a Restricted Diet. Many of us can strongly relate to this author's story and the challenges of receiving the correct diagnosis before it's too late. And here's yet another informative research study posted by an Italian scientific research team studying Kids with Celiac Disease Show Distinctive Microbial Signature. Next week's blog post will have a yummy pasta dish included and a few other surprises. 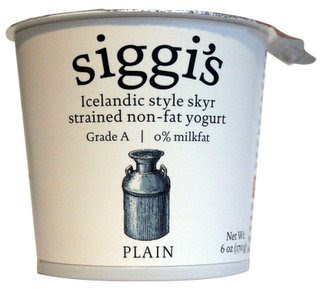 I hope you all ran out and bought some Siggi's Skyr since last week! I know I've been eating it every morning and loving my way through each delicious bite, while chanting my "ohhhmmmmms" in front of the fountain. Have a terrific weekend and share your compassion with the world! I'm very happy to report that my first half-marathon was a success and a wonderfully challenging experience! It's already been a week + since the race and I'm feeling the itch to sign up for more races...so next up, the Graeagle Triathlon on July 4th! I think I've got the "get stronger" bug and it's bittin' away. I've been relearning through all this running and training just how valuable the right foods can truly be for our bodies, and how it is the fuel that keeps the fire burning. Not only have I not been eating enough protein for a long time now, but I've also discovered how beneficial the right foods are at just the right times, when it comes to sustaining my energy and stamina. It's such a learning curve and definitely a work in progress. The night before the race, we cooked a yummy pasta, chicken, veggie dish that was perfect and served as good racing fuel. The morning of, (after not sleeping well at all, darn it) I ate a delish cup of my new favorite food, Siggi's Icelandic Style Skyr Strained Non-fat yogurt that I discovered while in Seattle with my Aunt, along with berries and peanut butter! The Skyr-style yogurt is non-fat and loaded with protein - 16 grams in just 170 grams or a small cup. It's my favorite breakfast and also a real treat when you sprinkle raw nuts and cranberries on top - give it a try for your next breakfast. The race is all a bit of a blur, but boy was I nervous at the starting line - as the starter's gun was fired I was surprised at how quickly everyone took off - setting a pretty fast pace from the get-go...oh, and I did I mention that the first mile was a long climb up a hill? Yes, it was. Lots of huffing and puffing at more that 1,000 feet higher than had I trained at. The course was gorgeous and in those moments when the pain set in or I was tired, I continually reminded myself to look around at the majestic beauty that was surrounding all of us runners, and to remember why I was doing this...for myself, for my spirit and for purely the gift of having two legs to take me on this journey. So at mile 12, another big hill (can you believe that?! ), followed by more rolling hills...I kept saying to myself, "I did it - almost there! "...and let me tell you, I don't' even remember the last 1/4 mile - all I could hear was the announcer, the pounding of my heart and the joy of hearing people cheering us as I crossed the finish line. The last two minutes of the race I gave all I had and suddenly, nothing hurt, my legs were with me and there was a smile on my face to replace the grimace I was most likely carrying with me for the last 8 miles. The best part, aside from my running partner sticking with me, seriously...the super cool medals that every one of us racers received at the finish line. It's my little gold medal. Now that I'm home and have backed off on the running for a week I've been focused on refueling my engine and that's where Sigg's Skyr comes in...you have to try this yogurt. Little background - so I did some research on their company recently and their story is great. Their packaging did not specifically list any mention of gluten-free, though the ingredients seemed safe to me (but we never know), so I emailed the company and asked them. I received an email back from their marketing gal letting me know that they are in the process of receiving their gluten free certification and soon it will be "reflected on our labels in these upcoming months, so keep an eye out! "...I will. Not only did they respond quickly, but the other day in my mail box I received a package from Siggi's with coupons for their delicious Skyr. I was duly impressed with their customer service and the thoughtful gift of sending me such a valuable little package - I'm an even bigger fan now! And they are so green - their packaging is so simple and easy to recycle. Siggi's Skyr yogurts come in eight delicious flavors and are loaded with probiotics - always a necessity for a Celiac stomach. Speaking of, there's an interesting article that just came out this week about just that - Celiacs and probiotics, discussing new research that could eventually result in a probiotic treatment for celiacs. The article is focused around some of the work that Italian doctor Alessio Fasano, M.D. of the University of Maryland is researching on an ongoing basis. Though I can't give you the scientific specifics or research behind my probiotic experimenting, I can say without a doubt that they help my stomach tremendously and I swear by them. I take a great achidophilus capsule ever day of my life and am really hooked on Synergy Kombucha - they have settled my stomach many times and brought it back to life, on occasion. 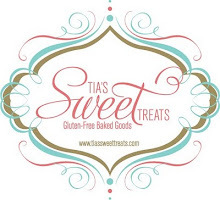 Another fun food/news item I wanted to mention was a great article that Tia's Sweet Treats received in the Summer 2010 issue of Edible Reno-Tahoe. 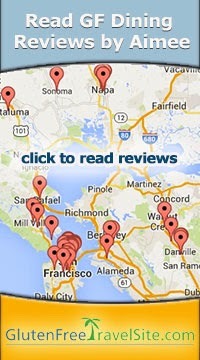 We so appreciate the great coverage and are baking away and taking orders. For those of you in the Reno/Tahoe vicinity or perhaps coming to this area soon, BJ's Restaurant and Brewhouse in south Reno is now serving gluten-free thin crust pizza. I have not tried this pizza yet, but I've heard through our Celiac group that another member tried it and the BJ's manager came out to discuss the details with her. BJ's does note on their menu, "With the exception of our meatballs, all of BJs Classic ingredients listed on the pizza page in our menu are gluten-free." If any of you do try it, please write in and let me know what you think, and I'll be sure to do the same. It's great to see that mainstream restaurants are recognizing and trying new items on their menus, but as always, our job is to make sure their staff, chefs and managers really KNOW what it means to be cooking gluten-free...so ASK lots of questions and be your own best advocate. If you give Siggi's Skyr a try, please let me know. Whomever submits the most tasty and creative way to eat Skyr yogurt will win a little prize that will sure to delight, and I'll post your delicious recipe here on Bowl of Soul. As you might have noticed, I haven't been keeping to my regular weekly blog posts - sorry! You see, I've been training for a half-marathon race that's taking place this Saturday in Sun Valley, Idaho and therefore, I've been a bit focused on my daily training regime in preparation for this exciting challenge! The past two years were so grueling on my body due to numerous gluten poisonings and I lost a lot of my athletic ability and strength, which was not sitting well with me at all. Once and athlete, always an athlete in your heart and soul...so in February, continuing with the commitment of 2010 that I made to myself to be my own best advocate, to inspire myself to greater fitness and safe, healthy eating, signing up for this race and committing to a training program felt like my calling. So I did just that - signed up, just for me. As my weekly miles have increased, I've paid close attention to my growing hunger pangs and what I have been fueling my body with. I've noticed that my metabolism has sped up, which hasn't happened in years and after loosing so much muscle last year, I've been determined to eat more protein, try more gluten-free grains (like more Quinoa -yum! ), cut back on sugar even more and limit my alcohol intake, which is never that much to start. As my body has been adjusting to the demands I've been placing on it, I wasn't sure how this would go - I mean, would I be strong enough to run 13 miles? So adding more healthy, gluten-free calories and good fats has been a priority and a fun challenge to keep feeding myself tasty, different foods that are loaded with nutrition. Kale is also still a favorite and a super-green! I came across an interesting article today via my Active.com e-blasts that arrive each morning, re-inspiring me to run faster, father, and keep up the good fight for fitness! The article, Eat Like a Pro with a Low Gluten Diet, is out of Canyon Ranch, and written by nutritionist, Hana A. Feeney, MS, RD, CSSD. It is a rather inclusive article and even discusses Celiac Disease and gives healthy menu tips. She speaks about the 2009 Le Tour de France team and how they limited gluten in their race diet due to gluten being an inflammatory food in the racers' diet. "Removing gluten helped to promote optimal recovery from grueling climbs and muscle-burning time trials. Included on the list of inflammatory foods were items containing gluten, a protein in wheat, barley and rye." After reading this article I was reminded once again, that eating the Celiac, non-gluten diet truly has so many nutritional benefits to a healthier overall body. It offers less food-related complications that can arise from eating foods that tend to inflame the gut, are over processed and can misguide a body. In preparation for Saturday's big race, I've been eating a lot of Quinoa and really loving it - however, our meal of choice for the pre-race night will probably consist of some kind of delicious gluten-free pasta, grilled chicken and lots of fresh veggies...with cheese, of course! I'm so looking forward to this great challenge and as I cross the finish line and am proudly presented with my race metal (yes, we all get one!) I will be thinking about all the other Celiacs in the world who are perhaps struggling to find a diagnosis, or just learning about the disease and feel overwhelmed. The truth is, living as a Celiac can be a huge challenge but it also comes with many little/big joys and triumphs. Saturday's race will be one of those little/big triumphs for me and my body. We are so looking forward to the challenge!